History: Maya is a petite cutie. 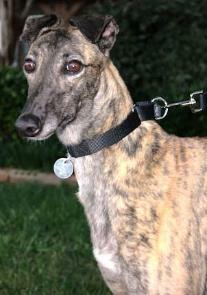 Her coloring is unusual in that she has a red brindle body with a dark face and ears. Look at those adorable fortune cookie ears. She had a less than sparking racing career and thought life would be better as a young retiree. Maya is half sister of Rippin Rita, both having the same mother Skymindy. Maya is a little tentative when she first meets you but warms up easily. 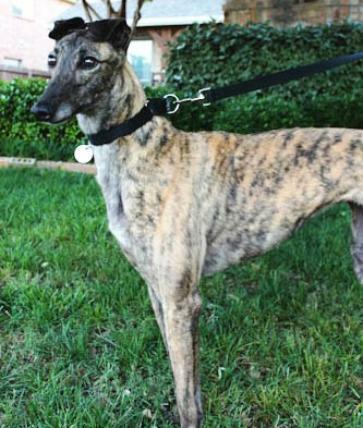 Maya (now Maggie) went to her lifetime home with another Greyhound and 3 Italian Greyhounds and mom and dad, Sonny and Karin. 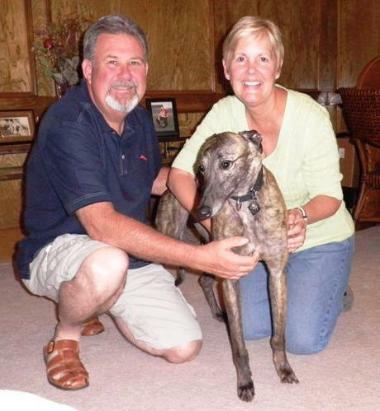 May 13, 2012 update: Maya, now Maggie adopted to her loving, lifetime home. 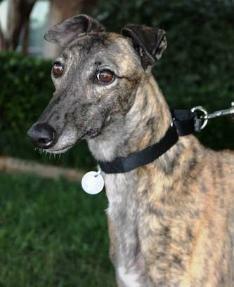 April 24, 2012 update: Maya came to TAGS to find her loving lifetime home.